"I have plenty of experience in Spiritual Evolution, over many lifetimes. I can help highlight inner distortions and thereby catalyse the evolutionary process for people." Right now our planet is undergoing a quantum leap in consciousness which is calling into question the very fabric of any structure founded on a lower harmony. That's why our society is becoming so unstable. Making sense of your spiritual unfolding: why our lives are being influenced as they are; to understand the bigger picture, and thereby smoothly ride the transitions of consciousness. Expanding your insight to the profound nature of reality - our multidimensionality - unleashing transformational energies to catalyse your evolution. Providing tools, tips and advice, to inspire the release of internal blockages, conditioned behaviours, limiting thought forms and past life karma. How to transcend the limiting confines of the merely physical; and thereby expand into the profound divinity that you are. "These Openhand Seminars are not about speaking at you, we're resonating a vibrational frequency, unraveling inner density and expanding higher consciousness." 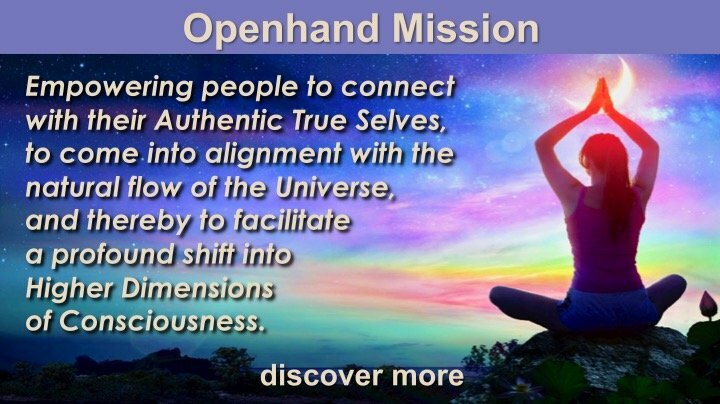 Openhand has been helping inspire this planetary shift of consciousness for twelve years now, working both with individuals and groups around the world. We purposefully maintain our pricing low so as to be all inclusive. We simply ask that our out-of-pocket costs are covered and a meaningful energy exchange acceptable to both parties. That is something we can talk about when you contact us.